On my summer quest to try as many sports possible, I knew I wanted to try cricket. I was born in the founding country of cricket, so I had my hopes that this would somehow make me a natural (spoiler: it didn’t). From its humble beginnings, it is easy to see where the sport is heading with the traditional game time of five days being cut down to a game around 3 hours today. While not many Canadians have played cricket, most of us have heard of it. This is due to the sport being brought by British settlers that descended on the globe during colonial times. The largest cricket leagues in the world are primarily hosted in former British colonies including Australia, New Zealand, India, Bangladesh and Pakistan. These countries have now become cricket powerhouses that dominate the world stage during the Cricket World Cup every four years. 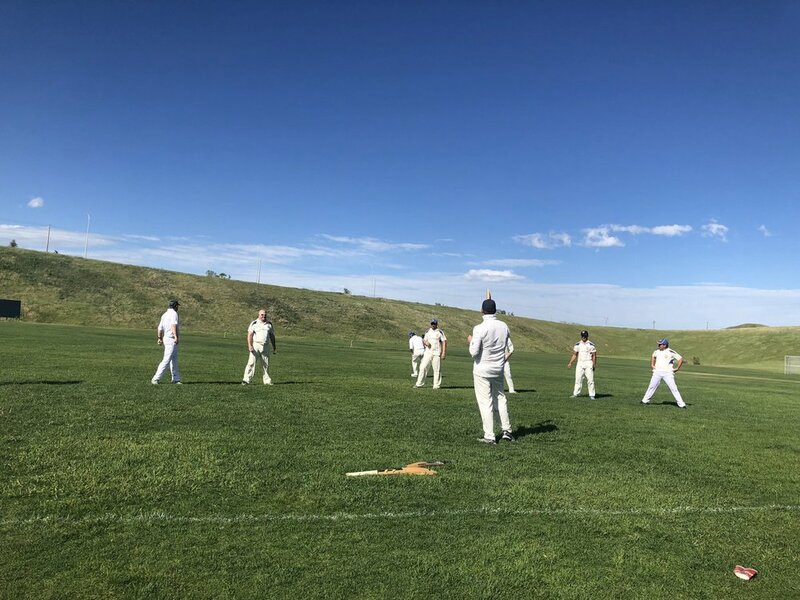 With all the history and prestige that this sport has, I was very surprised when I arrived at Inland Athletic Park that the Glenmore Cricket Club plays at. The field was extremely uneven making the ball bounce unpredictably down the pitch (partially why I missed the first 20 bowls). Looking back, the field should have been the first inclination of the underwhelming respect that cricket has in Calgary, as the battling cages looked like they had caged a lion in a previous life. There seemed to be a family of gophers living in the cages which had numerous holes in them, with a ragged piece of tarp flapping in the wind. Alex Storey, former president of the Glenmore Cricket Club, told me that there was a different pitch that they play at a few times a year. This pitch is in Riley Park, in northwest Calgary nestled amongst large trees and a scenic park. Cricket has been played there for over 100 years, first by British expats and then by the Pakistani, Bangladeshi and Indian communities. This was the type of experience that I thought I would have at the field I went to, not a strip of grass nestled between Stony Trail and the Spy Hill Landfill. While cricket may seem like a simple game, it is far from it. The first part of the game that I learned was how to properly bat at the balls being hurled at me. As the goal of cricket is to protect the wicket behind you, I just had to hit the ball away from them. This may seem simple, but hand-eye coordination is not my strong suit. It took me a couple minutes of practice and plenty of instruction, but after that, I started to hit the ball (more of a bunt). Once I had semi-mastered this skill, I headed over to the batting cages to give bowling a try. I want to point out that Alex describes throwing the ball as the hardest part of the game. Bowling, as it is called, sets up the entire game, as you cannot play unless someone is going to bowl. Unlike baseball, the bowler is not allowed to bend their arm during the throw in cricket. It needs to remain straight the entire time, which can feel unnatural at first. After I had gotten a hand for this skill, I progressed to adding the signature run into my throw. Please bear with me in the video below and remember it was my first time. When I first tried to incorporate a run into my throw, I had to be mindful that my arm needed to remain straight for the throw. I think that this mixed with the need for the ball to strike the ground and bounce towards the player was the perfect storm for me to not grasp it. With the instructor by my side, I got a grasp for it. Once I graduated from this, I moved onto catching (the scariest part). Catching was the main reason that I had never tried cricket. How can a solid ball hurling towards you not hurt when you catch it with your bare hands? I was assured that this was one of those mind over matter instances. To my amazement, I caught the ball and it didn’t hurt at all! All these years, I was worried about this very moment, which didn’t immediately cause my hands to fall off. Throughout all these hardships that the cricket club has faced, the sense of family has only grown stronger. From the moment that I arrived, to the moment when I left, I never felt like the annoying intern asking a million questions, but a part of the team. Alex’s love of the game is so immense that the club even practices in a teammate’s warehouse when they can’t find a facility. If you have ever had the urge to try out cricket, there is no better club to try it out with.